You can see the movement of paddlefish released in 2014 and 2016 and adopted by a school or other organization on the tracking map. The batteries in the radio transmitters implanted in paddlefish released in 2014 have worn out. So the ability to track them ended in mid 2015. The batteries in the 20 or so fish released in 2016, should last at least a year. All of the fish shown on the map were raised by the U.S. Fish and Wildlife Service at its Tishomingo National Fish Hatchery in Oklahoma, Service staff also surgically implanted the radio transmitters in them. Texas Parks and Wildlife Department furnished the vehicles to move the fish to Caddo Lake where the Service, the Department and some local students and residents helped release the fish into the Lake. Each of the transmitters gives off a unique signal that enables the fish to be “tracked.” The tracking data is recovered from five receivers stationed around the lake and from monthly boat surveys with receivers. All data is then posted once a month on the tracking map. The tracking map was created and is updated by the U.S. Geological Survey’s National Wetlands Research Center in Lafayette, Louisiana. The map opens with five popup menus to assist you in using the map. You can hide and unhide them by clicking on the Help bar in the bottom right of the screen or on the individual menus. As fish from Phase II (2016) are adopted by schools and other groups, their ID# in the drop down list will be replaced with the name given to them by the adopting group. Hold your cursor over a tower or boat icon. If the fish was recorded at that location, the data will pop up. Observations noted on the tracking map for each fish come from either stationary radio signal receivers or from observations made during surveys by boat. Location data uploaded to the tracking map are not in real time. Data is captured as fish move within range of one of the five receivers or when located by boat. Recorded locations can only be viewed one fish at a time. Schools and other groups are “adopting” fish, naming them and using a tracking map and other information on CLI’s website for education and other purposes. This aspect of the experiment was begun in 2014 and will continue for at least the 2016-17 school year. The Collins Academy is providing additional information and support to the schools involved in the program. As discussed on the project page, this experiment is part of a larger effort to restore healthy freshwater flows to the Caddo Lake Watershed. The paddlefish experiment provides one example of why that restoration effort is important. Phase I of the experiment began with the release of forty-seven, two-foot long paddlefish with radio transmitters in March of 2014. 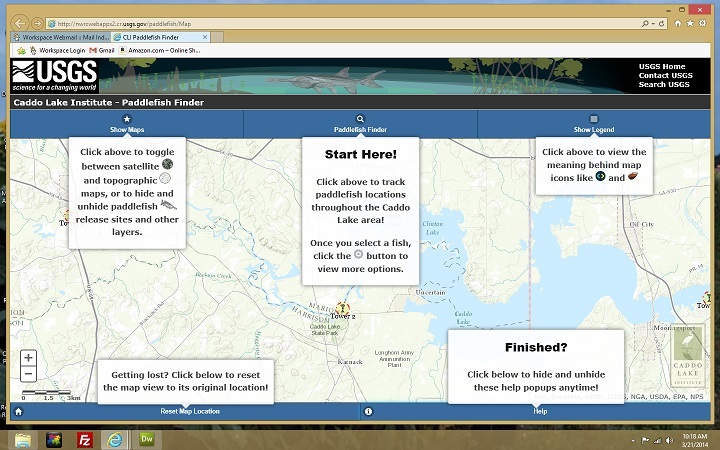 Data collected from tracking the fish with towers along the watershed and by boat was posted to the tracking website and can still be viewed there. Tracking showed that, during that time period, the batteries in the transmitters were working, until May 2015, and that those fish were healthy and growing. All remained in Caddo Lake or upstream. You can help extend and improve this experiment and allow more schools and other groups to use the experiment for educational purposes by sponsoring a fish or equipment or otherwise contributing to the project on our Donate page. Or email us at info@caddolake.us for more information.